Historic Ships: get on board! 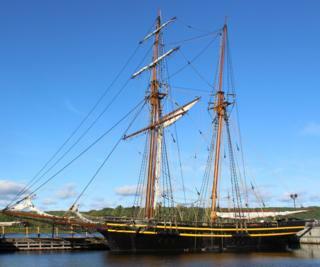 Discovery Harbour is home port for two large replica historic ships and a fine collection of smaller vessels. Get on board, and feel what life was really like for the people at the Penetanguishene Naval Establishment in the early 1800s. Your site admission includes access to all vessels at the harbour. H.M.S. Bee is a full-scale replica of her namesake, and an honourary British Navy ship. At 79 feet long, H.M.S. Bee represents the original supply schooners (Bee, Mosquito, and Wasp) stationed at the Penetanguishene Naval Establishment from 1817 to 1831.The original Bee was built in Nottawasaga. It ferried goods and men between the Nottawasaga depot and Penetanguishene, and made occasional trips to the Northwest. While the replica H.M.S. Bee is built from both modern and traditional materials, her appearance closely matches the original. Frames are built of fir, stanchions of oak, and deck beams and spars of pine. The frames are covered with a fibreglass laminate structure, and the outside layer resembles traditional planking. Standing and running rigging uses natural fibre rope and modern materials. The Bee flies a total of six sails (main, foresail, jib, flying jib, gaff-topsail, and staysail) and has modern navigation and safety equipment. The ship is moored at the King's Wharf and can be visited as part of site admission. Length on Deck: 49 ft. The warship H.M.S. Tecumseth is a 124-foot replica. 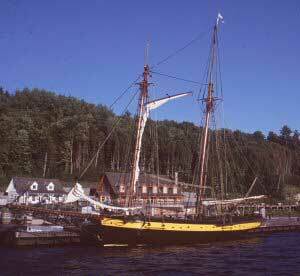 The original was built in Chippewa in 1815 and transferred to the Penetanguishene Naval Establishment in 1817. One of two warships at Penetanguishene, the original Tecumseth eventually rotted, and was reported sunk by 1828. The hull of today's replica vessel was constructed in St. Thomas in 1991, with spars, rigging and interior work done by volunteers and staff at Discovery Harbour. H.M.S. Tecumseth is also an honourary British Navy ship, reinstated when she was commissioned in 1994. This impressive vessel can be visited as part of site admission. Length on Deck: 70 ft. The Jolly Boat was a general purpose ship's boat used by the Royal Navy. Since it was used to bring fresh meat aboard ships, it was often called a "blood boat". Jolly Boats could be sailed using either a lug or spritsail, and could also be pulled with oars. 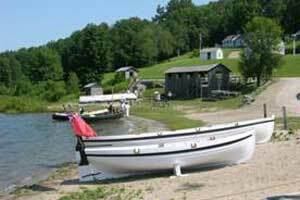 Discovery Harbour's Jolly Boat is constructed of pine planking on ash frames, and uses four oars. Beam: 6 ft. 7 in. Built with cedar planking on oak frames, the skiff was a small working boat used for harbour duties, crossing rivers, and transporting people and goods from ship to shore. The skiff could be rigged with a spritsail or pulled with four oars. Mainly used as a harbour boat, the gig was a quick vessel that was also used for mapping and charting. The gig could be rigged with a dipping-lug sail or pulled with eight oars. Discovery Harbour’s gig is built with pine planking on oak frames.